Board the flight for Leh. Arrive at Leh. On arrival free time for relaxation. Visit the Indus river, Shey Palace - the old summer palace of Ladakh Kings, the Thiksey Gompa Hill top Monastery, Hemis Gompa in Ladakh and Hall of fame war museum. (Subject to Operation). Full day to explore around the Pangong Tso. There are lot of rare birds and wild animals in the vicinity. 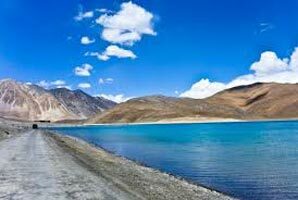 The lake at 14,500fts is the largest in Asia and its water stretch for more than 100kms from China, Tibet to India. 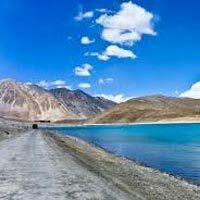 Drive to Nubra Valley - it lies in the north of Leh and is accessible over the Khardung la (5,570 Mts. ), one of the highest motorable roads in the world. The valley is on the trade route from Leh to Kharga via Saser and Karakoram passes. Visit the 350 years old Diskit Gompa famous for its murals. From Khardung-la drive to the village of Khardung. Pass by the Shyok River. Arrive at Diskit in the evening. Visit the Diskit monastery. The Gompa is one of the highest points near the village belonging to the yellow sect (Gelugpa). Parts of the gompa, which house 120 resident monks are about 700 years old. The Dukhang has many statues, one of which holds the head and left arm of Turkish invader believed to be about 5000 years old. Drive back to Leh in the evening. Visit the Shanti Stupa - peace seat of Japanese Buddhists, inaugurated by Dalai Lama. Ladakh Palace - Built by 16th century ruler Sengge Namgyal, which was badly damaged during Kashmir - Ladakh war. View of old town, Zansar mountains and Spituk Gompa (Gokhang). Enjoy Folk dance in the evening. Drive to Likir Gompa, which lies on the right side of Leh-Srinagar road about 4 kms from the main road and is famous for numerous Thankas. Further drive to Alchi Gompa. It bears the name of Alchi from the language of pre-Tibetan Dardic inhabitants. The Alchi Chos-khor consists of unique paintings, which may be attributed from the mid to late 11th century and was constructed by the famous translator Rin-chen bzang po. The paintings are characterized according to Tabo and Tholing. At the entrancegate, light stupas are constructed and are known as Kakini choten. Overnight at Uleytokpo. Drive to Kargil over Namika-la (3,697 Mts. ), Mulbekh where there is a Chamba statue carved out of a single rock approximately 50 ft. high, over Fatu-la (4,087 Mts.) which is the highest pass on Leh - Srinagar road and visit Lamayuru monastery which is the unique and oldest monastery in Ladakh. After viewing fascinating view of granite colour soil rocks, drive down through kangaroo curves to Kargil. Overnight at Kargil. Note for Operations : Lunch at Lamayuru. Proceed to Srinagar via Drass (Second Coldest inhabited place in World), visit Kargil war museum, Minimarg, Zoji la (3033 Mts.) and Sonmarg . After crossing the Jimmy Gate on Zoji la we enter Kashmir Valley - a lush green region that is exactly in contrast to the barren lands of Ladakh. Arrive at Srinagar in the evening. Visit Shankaracharya hill and the holy temple. Enjoy Dal Lake Shikara ride and visit island of Char Chinar. In the afternoon visit Nishat Bagh-'The garden of pleasure'. Enjoy shopping in the evening. Board the flight for your hometown.